Light and stiff racing poles. 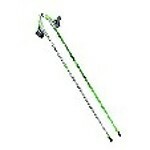 Ski poles for ski touring. Lightweight aluminum poles that are lighteight and functional. Nordic Walking Poles for summer (or winter) training.